Earlier, August 14, 2014, 10:25 : Asus may be working on an affordable Android Wear smarwatch priced in sub-$150 category, which will make it the cheapest Android wear smartwatch against the $199 Samsung Gear Live and $229 LG G Watch. And if the statement from the investor’s conference is to be believed that the CEO Jerry Shen purportedly revealed the plans to announce their first Android Wear smartwatch during the IFA Expo event in Berlin next month, then there might be a future for more affordable Android-powered wrist wear. Until May, Samsung and Sony were the only big players that had smartwatches present in the market. But after Google introduced its wearable operating system called Android Wear in March, which changed everything in the coming months. In short, we now have two Android Wear smartwatches by Samsung and LG present in the market while Moto 360 is slated to arrive soon. This is not the first time that Asus Android Wear smartwatch rumored popped up. In June, Tech Crunch reported that Asus might be planning to launch its wearable device sometime in September. And since IFA event is just three weeks away, it is arguable that this rumored wearable might show in Berlin. The Asus wearable tech will supposedly come with an AMOLED display, heart rate monitor and the gesture controls. Keeping in mind that Asus was revealed as one of the partners during Android Wear announcement in March, the Taiwanese company had a great amount of time to invest on the development of this device. Android wear is the first of its kind wearable OS, which plans to connect you via wearable devices and not just by wrist watches. Google also announced Android Auto at the I/O event this year, which will be able to interact with your Android wear smartwatch and will give you a better driving experience. While this is just a one use case of the wearable device, and we will see further usage of this technology as this ecosystem grows up. Though, the details about this device are still in scarce and don’t lay much weigh for now. But considering the market of smartwatches in future, every organization will be apparently ready to jump into this business, either willingly or maybe out of fear of being left out behind in this new growing market. Earlier, August 21, 2014, 15:00 : Looks like what we learnt last week about Asus coming up with an affordable Android Wear smartwatch is going to be true. The Taiwanese company has teased about an upcoming launch during the IFA Expo event in Berlin on September 3. Company has posted an image that certainly screams that a smartwatch is coming during IFA. As if that was not enough, the tweet also comes with a quote “Time has been transformed and we have changed”, which again means that the product is going to be watch related. And since we all know that watches are used to tell time. Earlier, August 29, 2014, 13:45 : At a recent press meet in Taiwan, Asus’s ZEO Jerry Shen reportedly told that the ZenWatch will be priced below, making it the most affordable Android Wear smartwatch. In a briefing, the Mr. Shen also quoted that the ZenWatch will be currently support voice recognition in English as well as Chinese language support is under work. The Asus wearable tech is debuting during IFA Expo in Berlin, and will go on sale from October, which is in par with the recently announced Samsung Gear S and LG G Watch R. It is also hinted that the ZenWatch might come with a SIM connectivity as the CEO also quoted about the standalone functionality of the device. Earlier, September 3, 2014, 17:00 : Asus has announced the ZenWatch, company’s first Android Wear powered smartwatch features Zen UI integration and boasts an elegant 2.5D curved Gorilla Glass 3 display. Company has done a great job of packing a 1.63-inch AMOLED display with 320 x320 resolutions, just like Samsung Gear Live. The ZenWatch comes with a 1.2 GHz Snapdragon processor and packs a 512MB of RAM and 4GB of internal storage. The smartwatch also features a bio sensor to monitor your heart rate as well as comes with an IP55 certification, making it water resistance, which means you can take this wearable under shower to give it a good scrub. For connectivity, the smartwatch uses a Bluetooth 4.0 connection with a device running on Android 4.3 or above. To power all of this, the Android wearable boasts a 1.3Wh battery, which will give a decent amount of running time. The other interesting sets of features included by Asus is Watch Unlock, where watch unlock feature lets you unlock your smartphone or tablet by simply tapping on ZenWatch’s watch face. And Tap Tap that lets you toggle around a pre-assigned function by double-tapping the smartwatch. The ZenWatch allows you to do some amazing things like control camera, presentations, etc, via three dedicated apps – Manager, Remote Camera app and the ASUS Remote Link app on your smartphone. Alas, the device is price at €199, which is approximately $260, which is more than the expected pricing of $199. 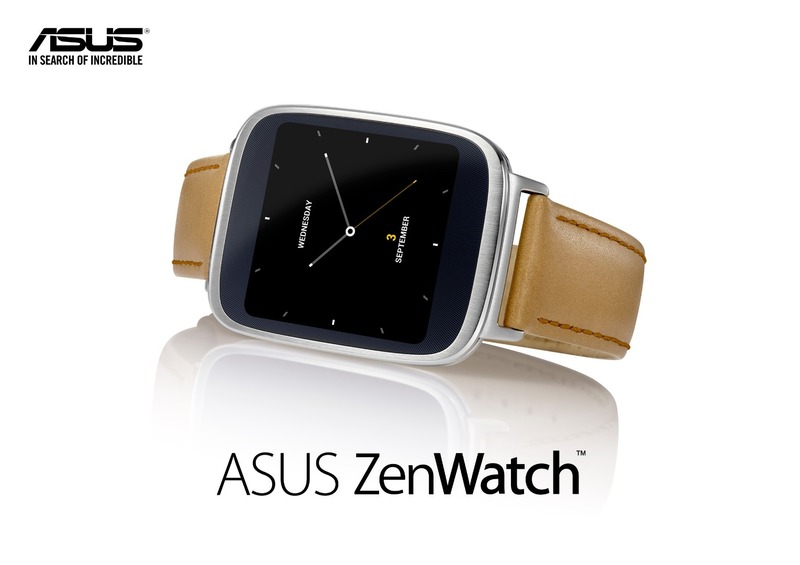 Asus ZenWatch is expected to hit the stores sometime in the middle of Q3 and Q4 this year. 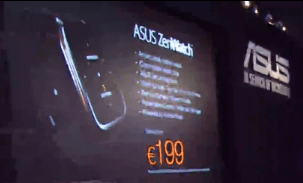 Update, November 10, 2014 12:20: When Asus first announced its Android Wear powered smartwatch called ZenWatch, the official pricing was about €199, which approximately converts to $260. But now it looks like company has priced their first smartwatch at $199 price in the United States. The device arguably comes under the category of the stylish watches we have seen so far, even though it does not sport a circular dial; company did manage to make it quite attractive. To remind you that, ZenWatch comes with a 1.2GHz Snapdragon SoC, and packs a 512MB of RAM as well as 4GB of internal storage. It touts an elegant 2.5D curved Gorilla Glass, which is packed under a 1.63-inch AMOLED display with 320 x 320 pixel resolutions. It will compete directly with likes of Samsung Gear Live, Sony Smartwatch 3, as well as the original LG G Watch. The device is on sale in the US at BestBuy for $199Asus ZenWatch with Android Wear Available in US for $199 – Details. Initially, the device sale will be limited to the Best Buy, though, later you will be able to purchase it via the Google Play Store in the country.